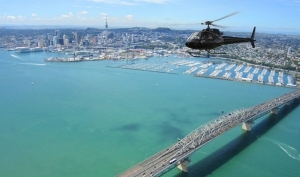 One of the best ways to see the city is by booking an Auckland Scenic Flight. By helicopter or small plane, you can zoom over some spectacular coastal and country scenery. Experience the trip of a lifetime. Scenic Flights in Auckland are a thrilling way to get out and about, over and above the city. Scenic Flight operators don't just restrict themselves to the metropolis, though. You can fly right over the stunning Hauraki Gulf and Bay of Islands, drink in the azure waters of the Coromandel coast, or head inland towards the volcanic wonderland of Rotorua. Flights can last from as short as 30 minutes, to 3 hours, or be tailored to suit you. Plane sizes can vary, from intimate 6-seaters, to larger 30-seaters, with some vintage aircraft available to offer a real nostalgic touch to your trip.